← All I want for Christmas…..
Firstly, let me say…. The Doppenberg family wants to wish each and every one of you, and your family a Muy Feliz Navidad! A Very Merry Christmas!!! Tomorrow (Christmas Eve) I have the privilege of killing, plucking, cooking a turkey for Fernando’s family (pray for me haha). Afterward we will walk through the town holding candles while someone carries the baby Jesus to His manger in the village Church at midnight. We are really looking forward to experiencing this. Welcoming our Saviour into the world the Guatemalan way. This is a beautiful country steeped with tradition… Its quite beautiful. 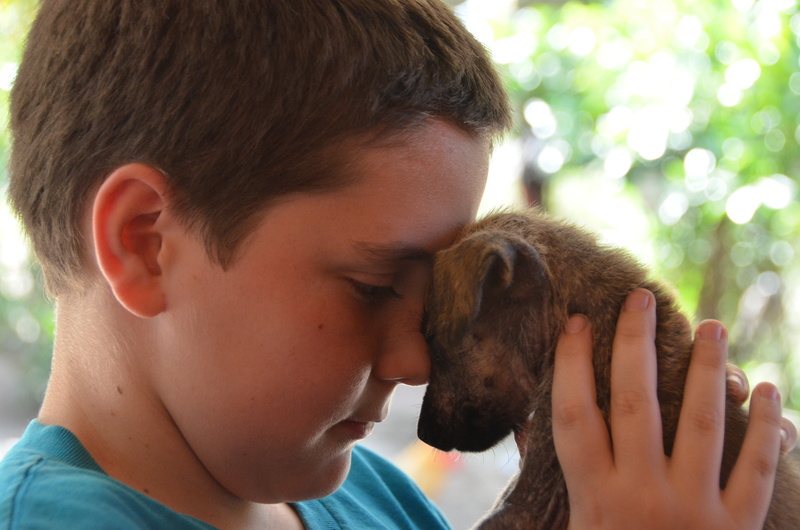 I spoke last blog of the best Christmas gift I could have received… a kiss and a hug from a group of kids in a remote mountain village… and a heartfelt, teary eyed, Blessing from Hermana Mercedes… there was more to come…. It all began at 5am when we opened our front door to a group of nuns standing on the sidewalk so excited to begin what was going to be an adventure for them. A kind, generous donor & friend back in Canada sent us money to help buy Christmas gifts for the Hermana’s and the kids at the hospital. We pooled that money with the money we had set aside ourselves for gifts and we decided that toys were great, but shoes were better after seeing so many of them walking around barefoot. We told them we wanted to buy them all shoes…. they were thrilled and timidly asked if we could take them shopping in the big capital city. They squealed with excitement when we said sure! Imagine being in your mid 50’s…. and never, ever going to a mall. Imagine you’ve never been able to buy something for yourself, just because …. Imagine you have never enjoyed a meal in a restaurant with your friends… Can you even imagine that? I know I couldn’t. 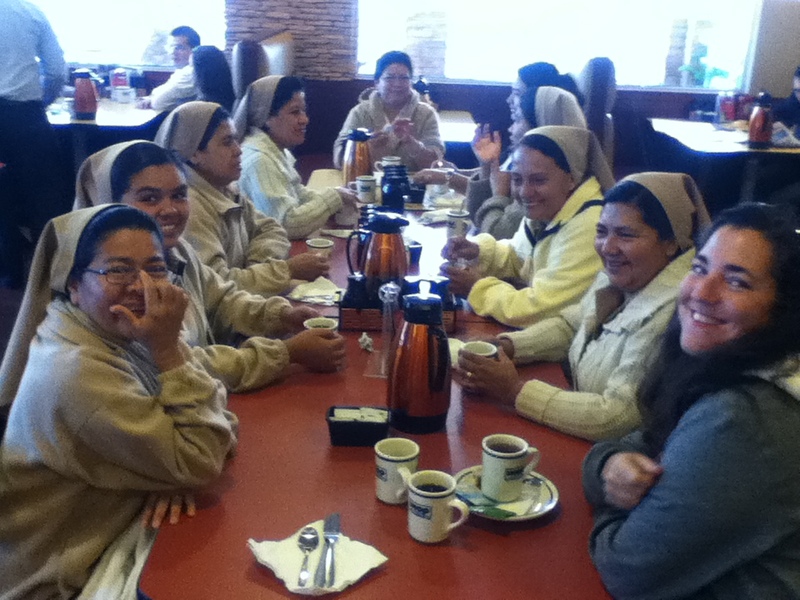 I don’t think my eyes could have gotten any wider when I was sitting in an IHOP in Guatemala City with 10 Hermana’s from the Hospital and Hermana Mercedes told me this was a day of many “firsts” for her. First time shopping for herself… first time eating in a restaurant with the other sisters…. I was shocked…. she’s in her 50’s and had never done these things. Little things we take so for granted in our life… like the ability to shop whenever, wherever and for whatever we want or being able to pick up a phone and say to a friend, “Lets go for wings and pizza tonight”. The day began like that for me. Humbled once again and yet mortified that we have so many opportunities and they have so few all because of where we happened to be born. 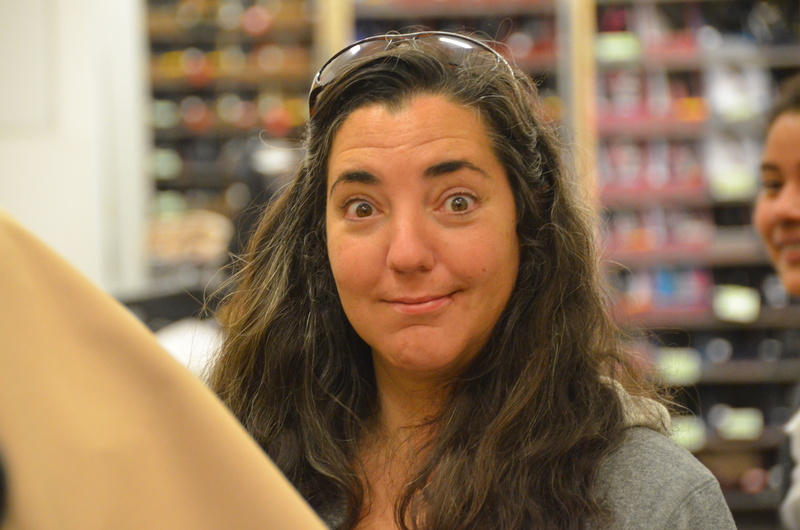 As the morning progressed, I watched in awe over the next 3 hours that we spent in a little Payless shoe store in a giant mall in the Capital City, as they shopped like pro’s. Hermana Alba had brought a list of the other Hermana’s, the Novitiate’s (Nun’s in training), and all the Nino’s (Children). Everyone got shoes… and some socks for the kids in colder mountain climates. This single random act made life easier here for almost 100 people! My Mastercard actually declined when it was time for the purchase to be made. It literally imploded and I had to call and it took more then 1/2 an hour for the security/fraud department to trust that it was actually me making what they called ‘the single largest purchase at a Payless” they had ever gotten… Shameless plug here… but if you want to ever contribute… please do… and I promise you that the money will be spent in a more worthwhile way than you could ever imagine. It truly doesn’t get any better than this. Next week our first volunteers arrive… this is so exciting for us. It has been kind of lonely here at times. 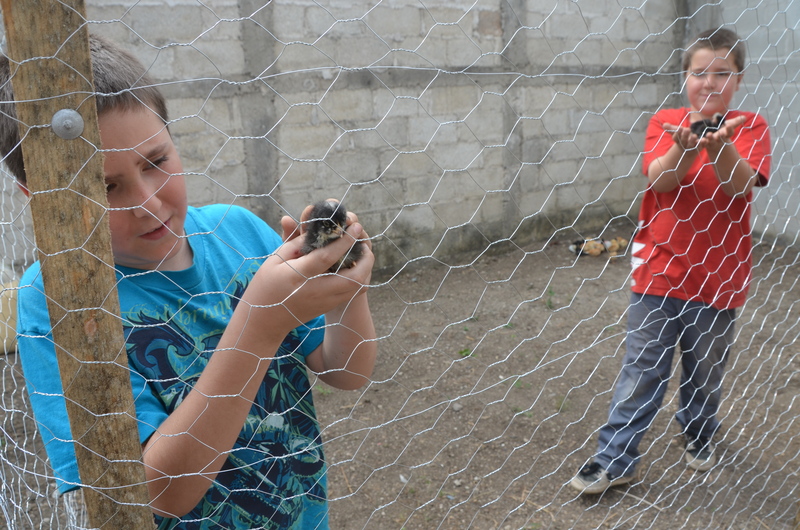 Together we will build chicken coops and plant vegetables for the Hermana’s. They will be able to both eat and sell these. It is our plan to help give them hope and a way to be more self-sustaining. They want this so badly, but have never had the means to do so. To raise a baby chick from birth to market costs around 15 Quetzals… which is approx. $2.00 Canadian. They can then sell the chicken for around 100 Quetzals. This is a no brainer for raising money for the hospital. But they have, until now been unable to afford even the mere 15 Quetzals to buy the first baby chick. Having us build the coop, provide the guard dog (even here at the hospital, the poor will hop the fence and steal from them) and buy them the first 50 or so baby chicks is invaluable to them to get started. It’s not just about raising money and buying things for the poor here… its about finding a way to get them on their feet and give them the little push they need by providing an opportunity to thrive. People tell me all the time how they can’t believe that we are doing this…. moving our family thousands of miles away for 1/2 a year. I guess after only a short time here I realize that we are the lucky ones…. the ones that get to experience this joy first hand. A few years ago if someone told me I’d be living in Guatemala basically on a farm, I’d have told them they must surely have bumped their heads lol. I’m just a girl who grew up in the city and look at me now…. 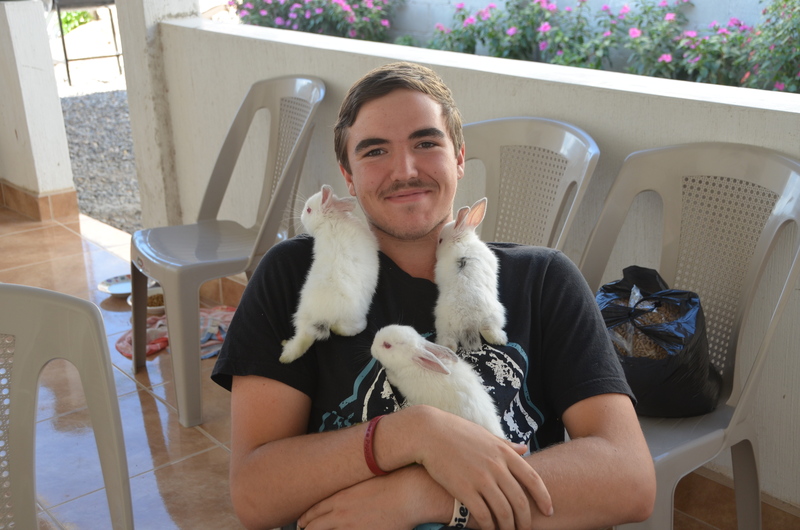 living with my family in Guatemala… in a home that we share with tons of baby chicks, 3 bunnies, and 2 puppies. 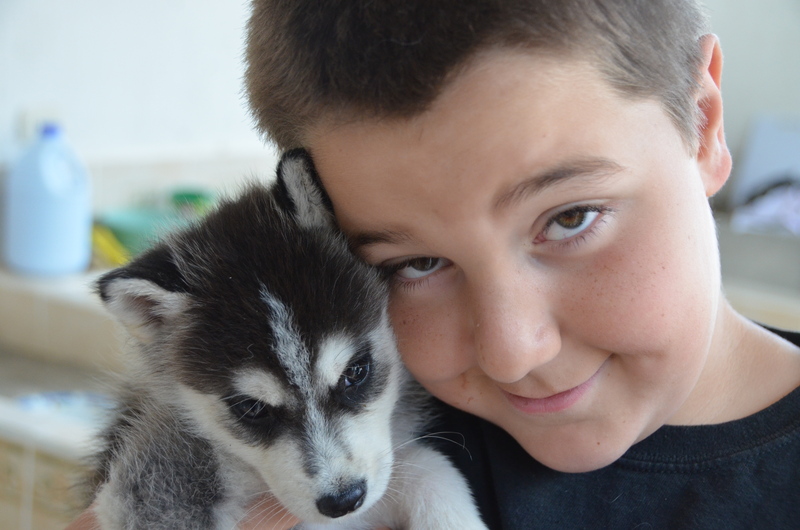 Yet everything has a use… the chickens & bunnies will provide food for the hospital… the puppies will provide security. There is no waste here… everything has a purpose. And so does everyone. I think that is what strikes me the most. Back in Canada we struggle to find our purpose…. why is that? Here, everyone know’s exactly where they are in God’s plan… while we read, and study and sometimes get paralyzed with fear and confusion over purpose. I realize now that we just have too much opportunity. It floods us and clouds our vision. Here life is simple and there is nothing to cloud anything. I can honestly say that it will be very hard to leave here and return home…. but I do know one thing…. All 5 of us will return home very changed people, changed for the better, and above all else THAT is the best gift we could ever receive. Posted on December 23, 2011, in Guatemala Missionary and tagged celebrate life, Guatemala, Malnutrition, mission, Missionary, Volunteers, World Impact, Youth. Bookmark the permalink. 3 Comments. I wanted to wish you a joyous and Muy Felize Nivida y una Prospero Nuevo Anno. Not much longer now for me to join you. My excitement grows daily.